Oh yeah, almost forgot. I tested the strength of all of it when rolling it from my garage to the back yard I rolled a wheel off the sidewalk. Yup, it flipped over. I was able to slow the fall but didn't try to hold it off as this thing is heavy. Luckily my neighbor was home and helped me right it up. Looked it over and ran it, everything was fine. What surprised me is it didn't separate from the stand as it just sits on the angle iron top. It is very close tolerance though and I suppose that kept it on the cart. SOOO glad it all turned out OK! What a disappointment it would have been if it had been damaged! I've been learning a lot from your photos and choices for your components. So happy you're here on the forum! Thanks Ralph! Yeah working on this is a lot of fun and keeps the old brain cells from completely drying up. ( I hope ) Yup, this Forum is great! So much info here and folks willing to share. I am really enjoying your build too. Some really nice work! You are going to have a primo machine. Made some tweaks to the burners today. I was getting to much heat at a lower pressure so I closed up about 25% of the holes in the burners. I will see tomorrow ( weather permitting ) on how it works. Originally I was concerned I wouldn't have enough heat, but I have plenty. My exhaust blower had a large screen on the intake side. I opened the exhaust tube up and it was full of chaff even though it was a large mesh a lot didn't go through. Lucky it didn't catch fire. You do not want ANY obstructions in the exhaust system anywhere. DUH! Lol! Sometimes the squirrel upstairs doesn't run fast enough; but, then again, he is old. Little bit by little bit it is slowly coming together. I will clean up the wiring when I get along more. Can you describe what we are looking at inside your panel? How are you getting the drum rpm to display as rpm? I have been using voltage, I know what voltage is for what speed but it would be much nicer to actually display rpm. Thanks! The two devices at the lower area of the control panel are PLC's. I had one for a long time and kept it to read the thermocouples (the creme colored one) also it has analog in/out for future use. The Automation Direct BRX on the right has high speed I/O and relay outputs which the other does not. There are two speed control boards in the panel as well that I got from Amazon and they are the same with the option of a potentiometer or 5vdc from a PLC analog control. I use DC motors because of control features that I like. The HMI on the laptop is from AdvancedHMI which is an open source free program and works well. I also use a bbq igniter with spark type ignition. That is on the left side upper. You can see the button on the outside of the side panel. Right RPM is when agitation is done right, could be different depending on load. I wouldn't rely on a fixed number for all kind of beans. Exactly. I can hear the difference between a smaller load compared to a larger load at the same RPM. Interesting thing I found out about heat in my drum roaster. I have perforated steel as the back of the drum and pull air through in the normal way with a blower. What I stumbled onto today while preheating for roasting is drum RPM vs temp. 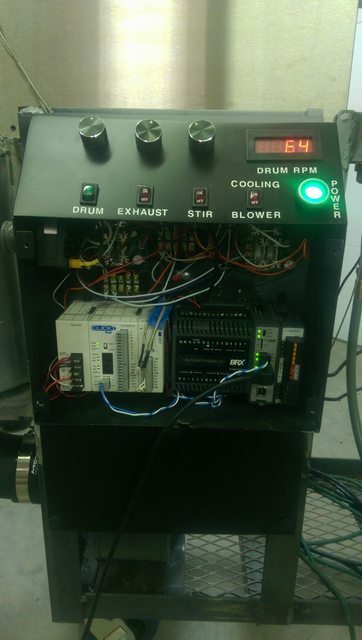 On my roaster, drum RPM controls heat through the drum to a certain amount. I am thinking at a higher RPM the holes in the perf steel on the back of the drum become more "open looking" to the heated air going through than when slower. 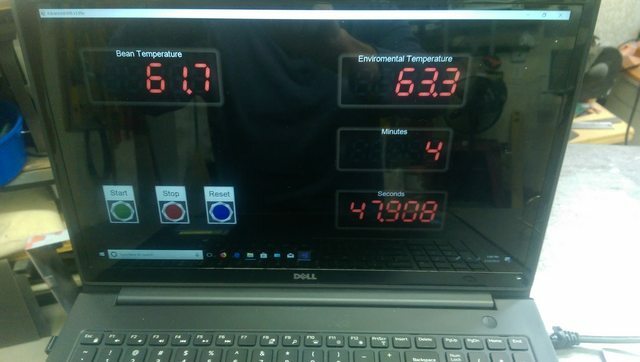 As the drum ET goes up, to a certain temp, the temp will level off and I can speed the drum up a bit and the heat will then again rise until it levels off. I find it interesting that I can keep increasing drum RPM and increase heat inside the drum as well at the same gas setting. That’s interesting. I’ve been thinking about why that might happen and if that could be leveraged to your advantage. Do you have a way of monitoring air flow? Would be cool to know if it is actually increasing the flow through the drum or just increasing the temp. How much did you increase the RPM to get this effect? What comes to mind is the affect that would have just after 1C on a crashy bean? no, I have nothing to monitor airflow, but it is an interesting phenomenon I have no clue about lol. Perhaps the vanes in your drum are acting as a little bit of a fan? I've heard that happens in some roasters when they are empty. I saw a Mill City vid not long ago and they were talking about profiling with Magnehelics. Not how to do it just that was the reason for the gauge.